As the original importer and distributor of the Lockwood 7444 Keyed Pocket Door Lock in North America, we have decided to clear our shelves and discount the product. We drop the price today to $120.00 from the previous price (12% less). Shipping and handling has not changed. New Pricing Exclusively available at the link in the source below. Pictured here are some statistics showing the depth of penetration, our website has experienced globally over the last 8 years. 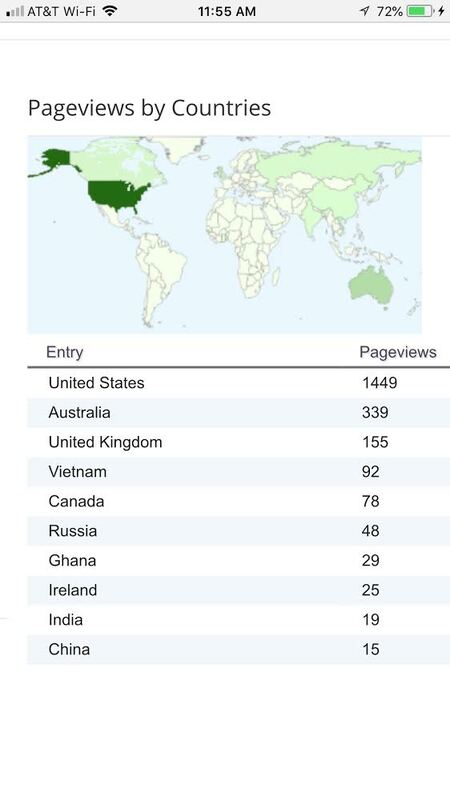 This chart shows the countries that lead the world in pageviews for our business. Our business has been going a little under 13 years now but records available through our blog platform can only provide statistics since May 2010. 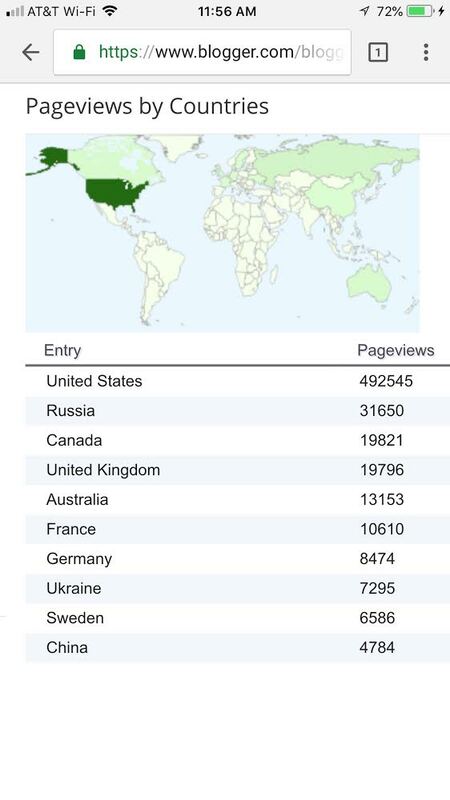 Having started the website in 2007, we naturally have significantly more pageviews than reported in these charts. Naturally, the United States leads the chart and by quite a significant amount. Obviously viewers in the USA are somewhat interested in what we have to say. But you can see that many other viewers across the world also appear interested in our opinions and writings with increasing pageviews by many other countries too. These are just the pageviews for the top 10 countries listed, as reported by our blog administration and just for the last week to Saturday 6/23/2018. Writing a blog, I have found is the simplest method for new original content to fuel our exposure to the world wide web. We have written well over a thousand articles since inception, on many products, services and locations that offer merchandise and expertise to help consumers, businesses, residents, governments, builders, building managers, real estate agents, aged care centers, hospitals and medical clinics, churches, temples, synagogues, universities and colleges to gain quality services and products at competitive costs. 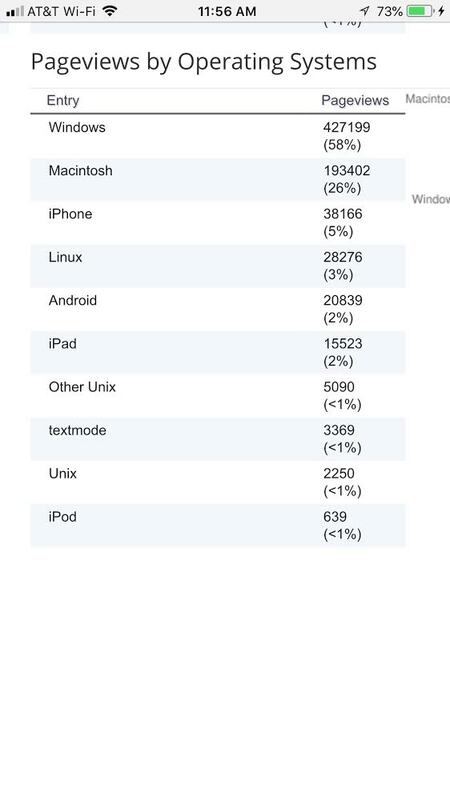 Interesting too, is the amounts and types of differing operating systems that have found their way to our website. Here is a chart that shows, over the last 8 years Windows operating system is by far the most popular choice for our visitors. Obviously a Windows user still enjoys the full benefits of the modern day computer user interface, significantly more than other operating systems, but you can see that mobile operating systems are also putting in a good show too. It is quite well known that Android OS is far more widely used and adopted outside the USA, probably because it is more competitively priced than the Apple options. 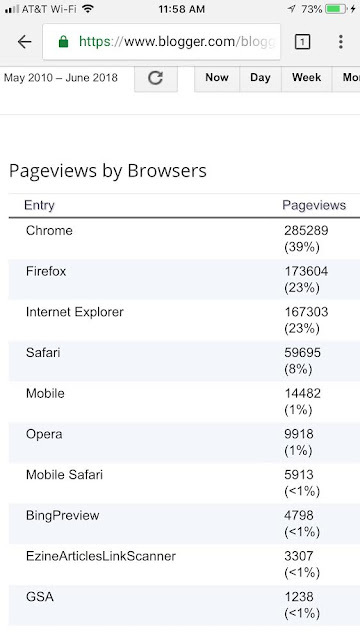 Our final chart here depicts the usage statistics of pageviewers by browser choice. You can see the period in the upper left of the image, May 2010-June 2018. 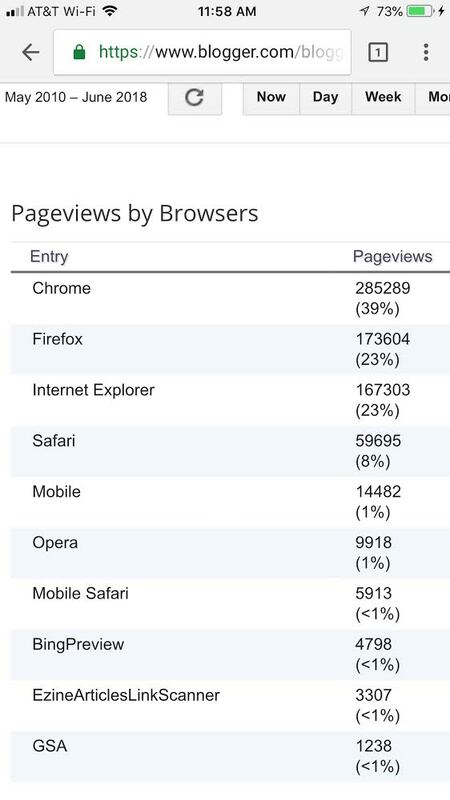 You can see that Chrome enjoys a significant lead in market share, of pageviewers seeing our pages. The number of browsers is an interesting statistic too. I had not heard of some of them (and I consider myself quite informed). So, why do I post these images of the charts displaying readership of our site? I post this details to show potential advertisers and post sponsors the value of your advertising or post sponsoring through our website and blog. Restaurants require bums on seats and plates of food sold. Cinemas require tickets sales of films and cartons of popcorn sold. Locksmiths and hardware manufacturers require eyes and ears on their offerings and a dedicated site that offers almost 7,500 pageviews a month and across the world, can provide you and your offering a wide readership. Contact us to learn about our sponsored posts and how (for a small fee) you can enjoy additional direct marketing for your product or service too. We first discussed this product, way back in February 2008. 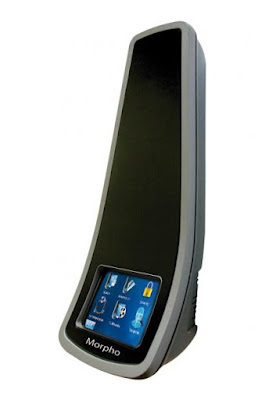 The Vision Access 3D Facial Recognition Interface was subsequently acquired by Idemia, a French company specializing in biometric access control devices. Under the company's brand name Morpho, they offer some different products tailored to the financial, telecommunications, identity, security and IoT (internet of things) industries. With modern day technological products continuing to evolve, the market is flooded with many styles and types of devices to whet our appetites. Morpho are part of a €3BN annual turnover company that has been around for many years and has earned a reputation for quality and longevity. Based in France, they employ over 22000 people worldwide, with representation in about 55 countries, including the USA. With customers desiring more efficient and higher quality access control systems, Morpho are the cutting edge industry leader in biometric products. Check the source below for more on the company. 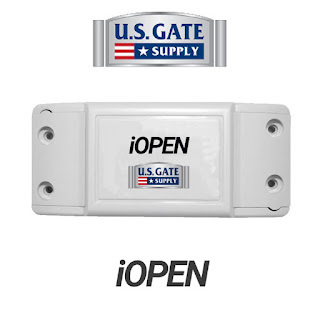 iOPEN is a relatively new product, currently exclusively sold by US Gate Supply of Southern California. 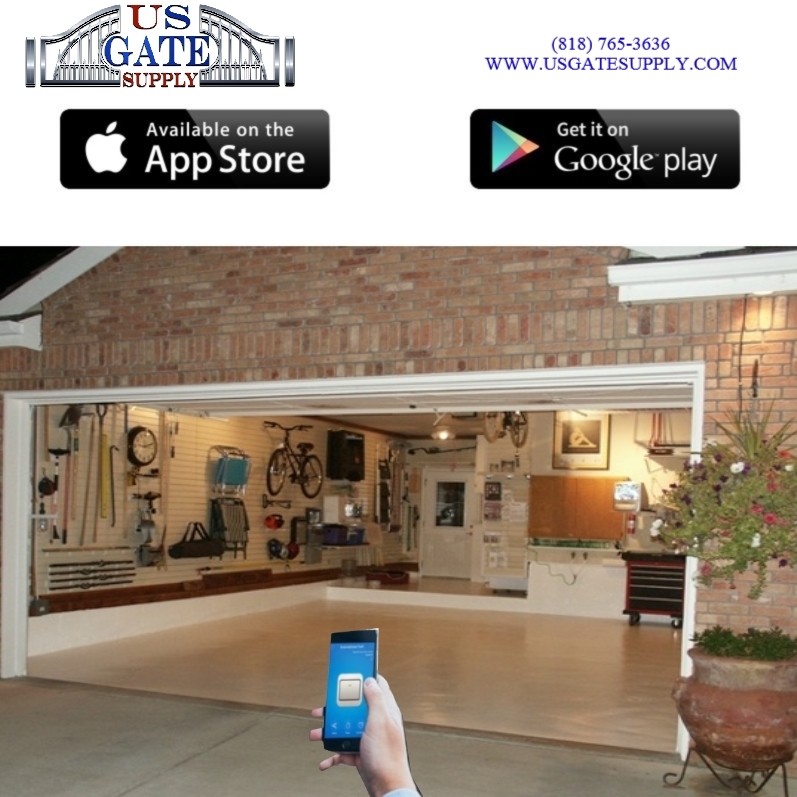 This exciting new product is designed to operate with about 90% of the current brands of automatic garage doors, mag locks, electric strikes and automatic gates available in today's markets. This product is different to the wireless options otherwise being bandied about the markets, in that it is actually hardwired to your current product. This product enables you to simply download the appropriate app from Apple's App Store or Google's Play Store. This is a typical residential garage door. You can see the app open on the users smartphone. 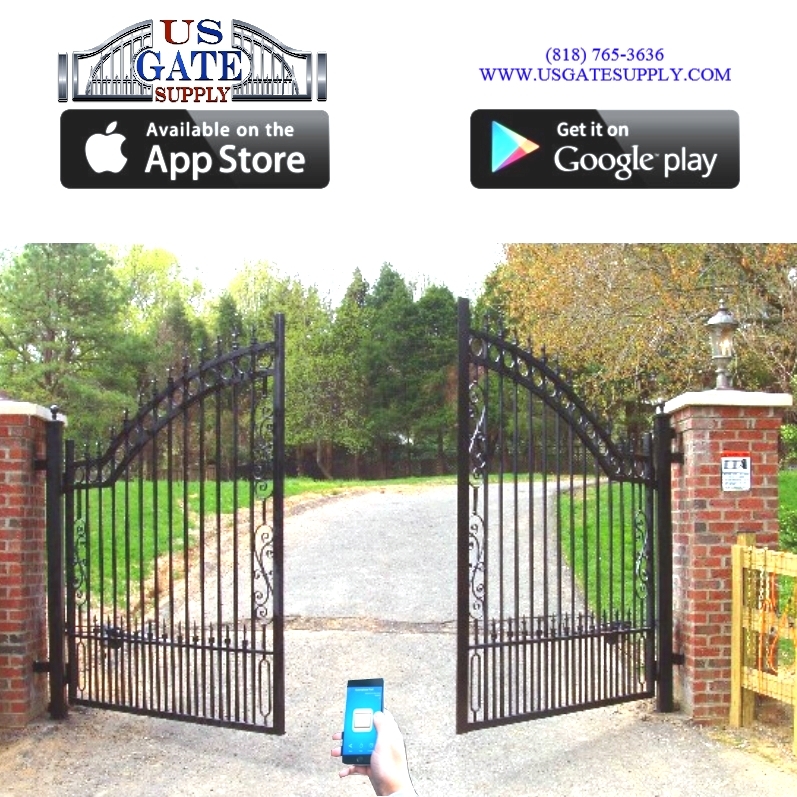 This an image of a type of gate you might find in upmarket real estate or perhaps a gated community. 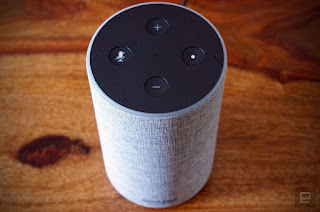 You can also connect the product to your Amazon Alexa smart speaker or your Google Home smart speaker. With the growing smart product market becoming an ever more staple of modern living, products that operate through the IOT (Internet Of Things) architecture framework are becoming the new sought after commodities. For a professional, keeping abreast of products and industry updates, new technology and items aimed at improving our and our customers lives, is an important attribute in today's business age. I like the idea of this new product and i think it could certainly see traction across the wider consumer marketplace. Amazon Key, which we have mentioned a lot in recent times, purports to offer would-be Amazon shoppers the opportunity to enjoy new delivery methods from Amazon. We continue to warn consumers that using services like Amazon Key, can potentially reduce any security you may currently enjoy and even potentially increase your insurance premiums. 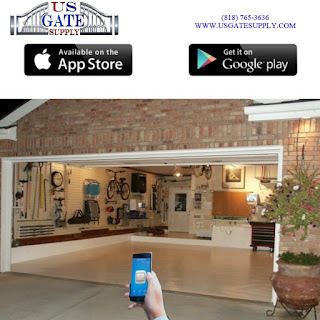 This new product might mitigate the threats posed by granting delivery drivers access to your home, by only enabling them to access your garage door, allowing you to keep the door connecting your garage and house, locked. Apparently the app can allow for separate devices to operate through the one app, meaning your one smartphone now becomes the remote control operator for multiple separate entries. Yesterdays article, "Has Tapplock Collapsed?" is seeing viral circulation and obviously is hitting a nerve. We have continued to write multiple articles over the last 10 years about pro's and con's relating to biometric and specifically fingerprint access control products. As you can see by our above link about fingerprint products, there are many options available across the wider marketplace, hoping to cash in on the fingerprint recognition phenomena, as well as conflicting arguments i have suggested, that fingerprint access control also comes with severe limitations. Our first foray into biometric fingerprint products was with the Bioaxxis Thumblock Deadbolt. Bioaxxis unfortunately couldnt survive the early years of the burgeoning fingerprint controlled door lock market. Their product was stellar. It worked very simply and was self preserving, even though they suffered from the debilitating issue of security control. Specifically, the need to reduce or turn down the security of the image recognition of the scanner to enable sufficient operations of the product. This unfortunate attribute contributed greatly to the products demise and I suspect the wider market too. The Tapplock article further reinforces the current-age issues relating to quality control. There is a penchant in recent years, especially since the beginning of the modern internet era, (Circa 1995 - And the beginning of Netscape Navigator - The beginning of The World Wide Web), to design and build new products without an element of care - but to quickly release to market to capitalize on new money. This unfortunate realization shows that the modern era, while showing significant improvements to our lives, is also moving far too quickly for our own benefits. Bioaxxis also came out with their commercial product a year later. 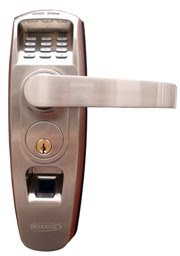 The Bioaxxis Thumblock Handle, with Key, Fingerprint, Proximity Pad and Digital Pad Entry, checked off multiple desires for total access control. We installed and sold about 7 of these fabulous products until we recognized that biometric fingerprint access control technology was seriously flawed and the best market for the promising technology was in the aged care arena, where elderly users (who were constantly losing their keys and their ability to remember PIN codes) couldnt (for the most part) lose their fingers. The issues about scanner sensitivity almost killed the fingerprint market and combined with poor quality, rushed to market manufacturing from cheap manufacturing facilities abroad, has even seen stock market darling and leading technology company Apple, remove the readers from their most popular product the iPhone. Touch control products have made their way into many aspects of all our lives, but I suggest that security is not one that we will see to continue, due to the obvious shortcomings. I believe that facial recognition technolgy, Iris scanners and voice recognition will enter the mainstream far more rapidly and with better security features than fingerprint technology could have ever hope to achieve. 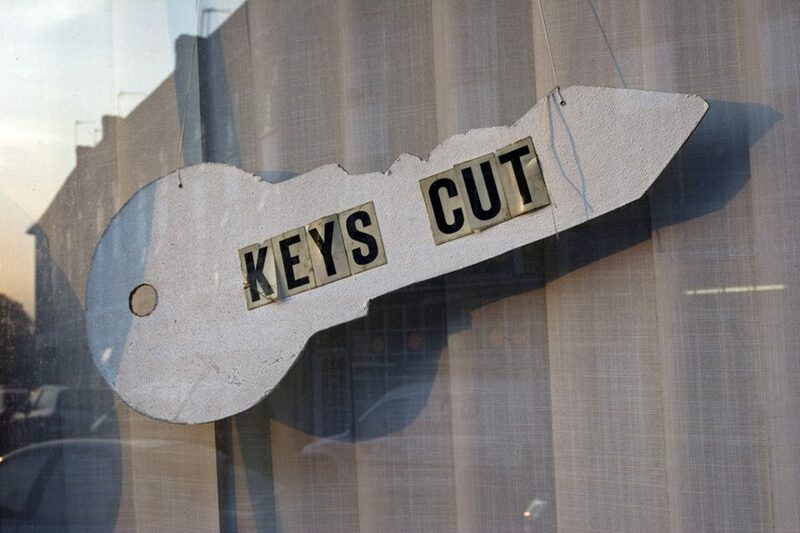 Key cutting shops pop up all over the world. The following images are of key cutting enterprises around the world. We have visited a lot of similar businesses in the different countries we have lived, worked and visited. Feel free to add your images in the comments section. Post are subject to moderation. If you recognize any of the locations, please mention where they are. Thanks. 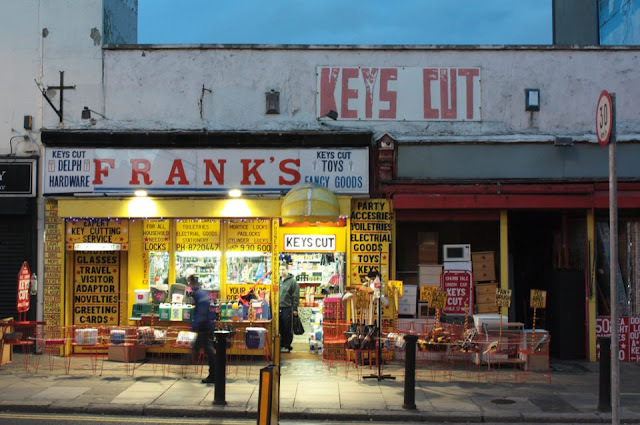 You can see that key cutting goes hand in hand with hardware and locksmithing, but also engraving and other general mercantile many people require. I have no doubt this shop in somewhere in England. Talk about a hole in the wall! Uh Oh! 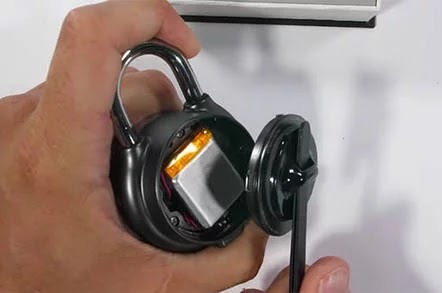 Tapplock reveals it's weakness! Tapplock, the darling startup that confused the market with their bluetooth keyless product in 2016, that we wrote about in November 2016 has been found wanting. Despite the promise and with $320,000.00 in crowdfunding was delayed until September 2017, six months later than anticipated according to a report (see source). Despite what consumers think they want, the ages old mechanical padlock is the most cost effective and simple solution to security. Virtually maintenance free, there are many grades of security that will enhance and protect your property. Breaking News: Allegion, the parent company announced 30 days ago (May 13, 2018), their acquisition of leading Australian residential door hardware manufacturer Gainsborough and at the same time the acquisition of Australia's largest locksmith service provider API Locksmiths. 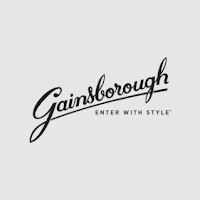 Gainsborough produce many leading residential door hardware among other offerings. 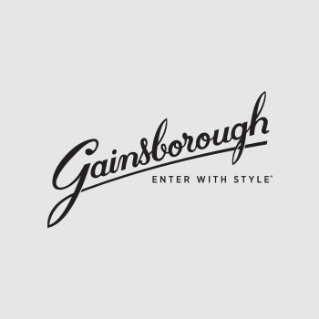 Gainsborough Hardware can be found in many dwellings and is even becoming a sought after offering to the wider USA market. API Locksmiths are one of Australia's oldest and longest established locksmith companies. 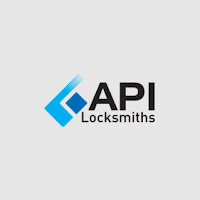 In fact, I completed my apprenticeship with AF Stewart Locksmiths in 1988 before they were later (much later) acquired by API Locksmiths. This acquisition by Allegion is a major shake up of the locksmith market across Australia. AD Systems are a company first established in 2013 specializing in upscale commercial sliding door entrance systems, tailored to hospitals, medical clinics and offices to meet the modern needs of doctors, architects and space conscientious builders and tenants. Mettem-Production LLC are well known as one of the leading lock and security product manufacturers in Russia and the Eastern hemisphere. Established in 1992, they quickly became an established name in the greater Russian region, for their super-high quality range of unique door locks and electro-mechanical security solutions. I realize that in many parts of the western hemisphere, some people harbor negative thoughts about Russia and Russian products, with some political regimes choosing to enforce trade sanctions to attempt to harm them financially. We choose to not enter into the political debate herein and prefer that this site continues it's core objective of informing you about products and services we recommend, offer, discuss and like. Mettem produce leading products in the mortise and rim lock range, electro-mechanical, mechanical, cylinder operated, mortise key operated, combined cylinder and electronic operated, code operated even specific locks tailored for fire-proof doors. Mettem locks are made using high-quality alloy steel construction that complies with and often exceeds the strict Russian Governmental standards regime. (which arguably exceeds the Underwiters Laboratory regime in America). Mettem reapply for the Government certification every 2 years to maintain their supremacy in the market. Their products are factory warrantied for two years from date of sale. 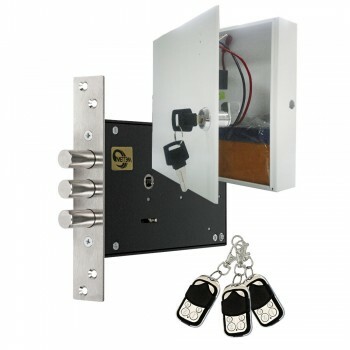 Mettem locks use a variety of protection methods to augment the quality of their offerings. Some of which we have listed below in their mortise lock product. You may notice a resemblance to the well known Hooply range of products that we have written about often. The wide range of products in their offerings indicate their desire and ability to provide second to none options in their local market. You can see the great range of available models in the source below. We will show a few of their products below, to give you an idea of their fabulous and varying range. Pictured here is the Mettem Leader product. You can see that this is an 8 or 10 lever high-security mortise (skeleton type key) product. 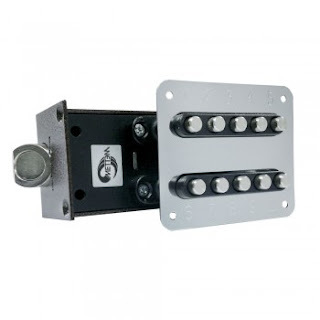 Stainless steel bolts with long throws sit inside an all-steel housing that is very very strong, almost to the point of bullet resistant. One of the bolts is made from extra-hardened steel to prevent saw cut attack. The Mettem 318 is a combination 3-point locking solution that offers conventional Euro pin tumbler cylinder control, meaning you can use your high-security restricted and patent controlled keyway cylinders, that you use in your commercial master key systems. The tabs top and bottom (of the casing) connect to rods inside your door frame to enable top and bottom reinforcement. The Mettem Rim Lock range also varies in models. 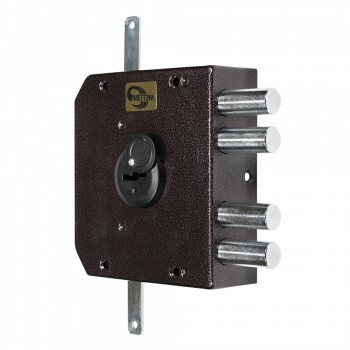 This particular unit is a rim lock with top and bottom rod connections for 3 point protection and extra security. This model shows the inside keyhole, which would not comply with many jurisdictions in the western hemisphere where you are required to have a turnbutton for emergency panic escape. 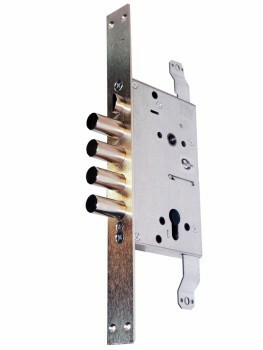 This is also a 10 lever high-security virtually pick proof mortise (skeleton type key) cylinder. The Mettem ZV EM 01.01 is a unique product that is hardwired (with battery backup). 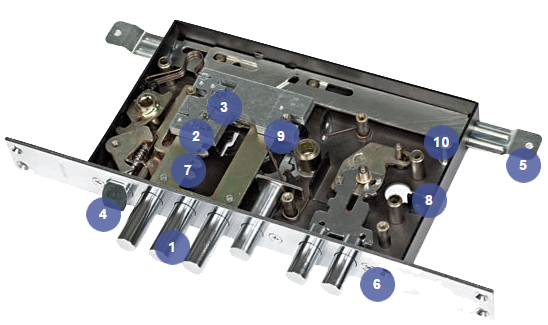 It is a mortise lock with no visible keyhole on the outside, making this unique solution virtually impossible to defeat with conventional lock breaking tools. It operates using remote controls. The Mettem ZKP is a surface mounted RIM latch that is easily installed and uses a mechanical combination keypad. 1000 possible codes that can be changed easily on the fly. 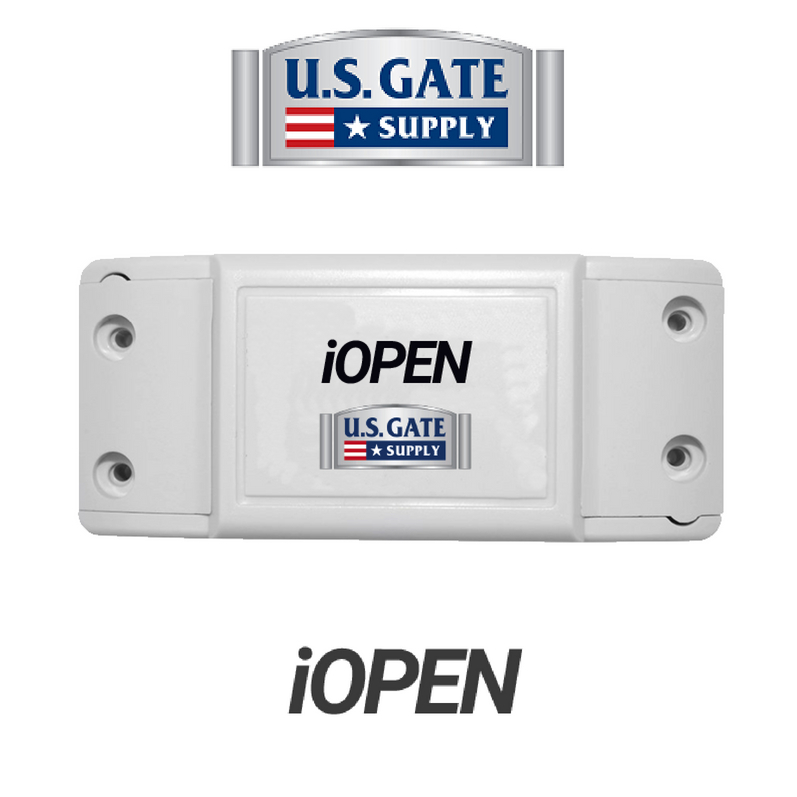 Users can recerse the latch easily for outward or inward opening desire in the field. The GSM control unit is a fabulous piece of technology that allows you to operate your lock or locks via a cellphone or PC (landline too). Completely controllable via sms or pc, a manager can modify, set up new users, remove or block users easily on the fly. 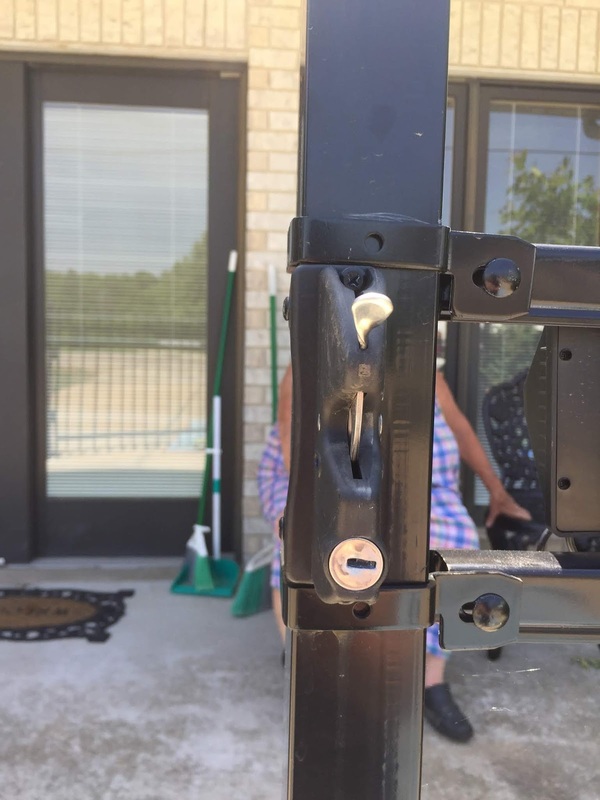 This product operating with one of the high security invisible mortise locks will create extreme security for communal entry doors in apartment complexes and corporate environments where multiple different people require access across different times and locations. they can also be programmed to allow the remote control credentials to operate separate locking units in the same environment, meaning you only need one remote for multiple different locks. Amazon are reeling recently, from reports (like the Engadget article in the source below) indicating that the AI (artificial intelligence) built into this modern day search porthole, is actually listening in to all your private conversations in your home or office. The article in Engadget goes on about a couple in Oregon whom have been directly affected by this "storm in a tea cup". Apparently the AI used by Alexa listens continually for it's activation keyword, in all conversations within earshot of the devices microphone. The couple in question were luckily alerted by the husbands employee, who called him and shared the recording of the conversation sent to the employee by the Amazon Alexa AI. The couple immediately reported the issue to Amazon and through their investigations and testing of the devices logs (stored in the cloud), determined that the events as dictated in detail, indeed occurred. More troubling however is a report that surfaced recently about hackers from Zheijiang University in China, who discovered a flaw in voice control products including Siri, Google Assistant, Samsung S Voice and Alexa, naming the attack "The Dolphin Attack"
The Dolphin Attack has shown that the flaw can allow for malicious action including operating the Smart Lock on your front door or opening web pages to malware sites. The Dolphin Attack was shown to be effective in exploiting the vulnerabilities in items like smartphones, iPads, Macbooks, Amazon Echo even an Audi Q3 - all up, about 16 devices and 7 systems in total. The researchers even claimed they were able to alter the GPS navigation on the Audi Q3. The Dolphin Attack works by sending commands in ultrasonic frequencies that are too high for humans to hear. Interesting too, I have personally witnessed the effects of activation of the Google Assistant function on my Android Smartphone, when it was plugged into my vehicle hands-free cradle as I was driving while operating the Google Maps function. A segment I was listening to on NPR (National Public Radio) was playing on my vehicle radio and when the reporter mentioned the activation command "Okay Google" or "Hey Google", my phone (which was running the Google Maps app), picked up the command and recognized the sound as another command (by me) and began executing that command. These revelations are especially troubling today because many consumers are opting for the convenience of IoT (Internet of Things) connected devices, to augment their lives. The security flaws accompanying many of these modern devices could potentially make our homes, our vehicles, our workplaces significantly less secure than bygone times. 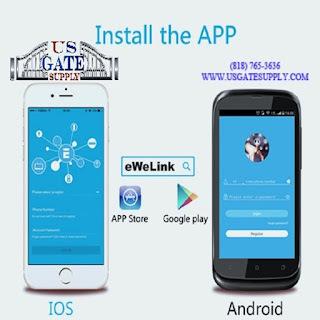 Working with your local locksmith to install mechanical or hardwired security products, that are not connected to vulnerable "smart" devices, may be the simple and yet still affordable/competitively priced solution to protecting your family, your workplace even your vehicles. 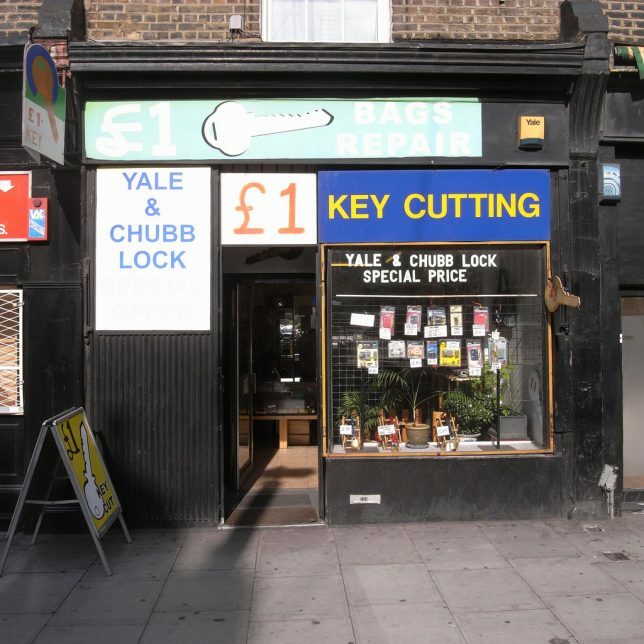 Most locksmiths around the world, will offer no obligation security appraisals and advice to keep you secure. they are just a phone call or email away. Your family, your colleagues and even your vehicles will likely appreciate your desire to keep them secure and protected. Recently we were called to upgrade a clients gate locks to double cylinder high-security and expand the already secure Bilock Extreme Security Key System. The system is a few years old, but it has been very effective in preventing her nosy neighbors and other vagabonds from getting in to her house. But these would-be opportunists continued to play games and were accessing her perimeter gates by simply picking the simple wafer/disc tumbler key cylinder found on the cheaper version of D&D Technologies gate lock. Following is a description of the process involved in dismantling the locks, installing the Bilock cylinders into them and then installing the new locks to the requested gates. This is what we saw on first time arrival onsite. The original lock installed to the gate and post shows the existing wafer/disc tumbler keyhole. 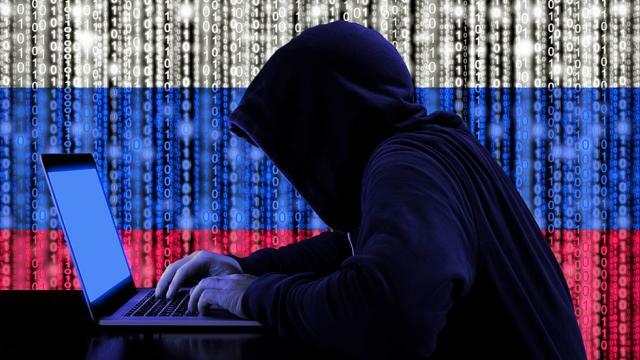 Following up to our post of a few days ago, the left leaning news site, The Hill, have written a new article determining that foreign cyber hackers appear to be targeting industrial sites, with deadly consequences feared. The article in the source below, tries to predict where these criminals are aiming their espionage. The wonders of the modern Internet of Things (IoT) age that we currently are living in, is not immune to the efforts of the nefarious among us, who try repeatedly to develop methods and means for disrupting our lives and causing havoc to our sense of security and well-being. 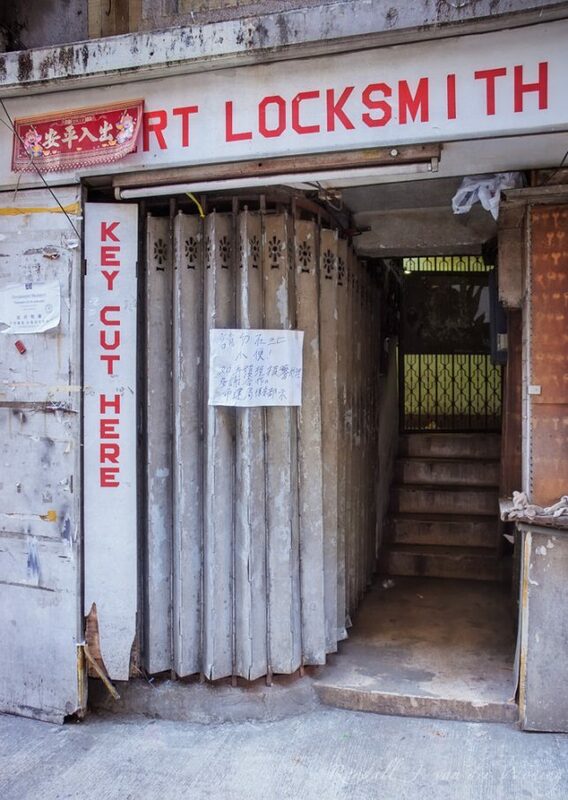 I'm a 35 year veteran of the locksmith industry, with experience gleaned from having worked on 4 continents. During the many years of exposure to security needs and wants of various customers around the world, I have found that many just desire to use quality products that operate easily, are competitively priced and above all, long lasting with little to no maintenance. Electronic security products have been evolving over many years. Originally, finding battery powered security products was difficult, because good security requires stable power systems and batteries that continually need replacing, inhibit a product from performing to a sufficient standard continuously and without maintenance. There are a great many AA and AAA battery powered door locks, cameras, door bells, alarm systems etc, that offer wide choices and features to whet our appetites. 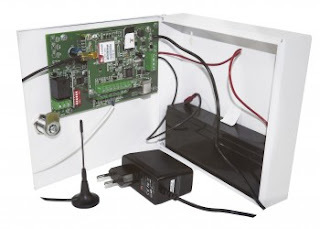 Unfortunately, to be able to offer the convenience of battery power, many of these products require to reduce the security elements inside, including the security of communication connections that "talk" to our home routers, Bluetooth devices etc. The article on Thursday and this follow up, point to this too. When you consider that for many hundreds (if not thousands) of years, we have been securing our homes and businesses with mechanical products, that stood the test of time, doesnt it make complete sense that we should continue to use the mechanical security products to protect us? Especially considering that mechanical products are often single purchase, come with significantly longer warranty periods, require significantly less maintenance and are (for the most part) significantly more competitively priced than electronic products of the same genre. I understand some consumers desires to enjoy "Keyless Convenience". But in reality, a code can be shared more easily than a key and often you cant know how many different people "know" your entry code. Whereas with a number of mechanical key products, you can be all but completely assured your entries are virtually bump proof, copy proof and extremely pick/bypass resistant. Providing you the security your home, family, office and colleagues deserve, while being super competitively priced compared to electronic and battery operated products. The maintenance costs alone are significantly less. And with the increasing number of cyber warfare attacks, being reported across news sources (and how many are going unreported? 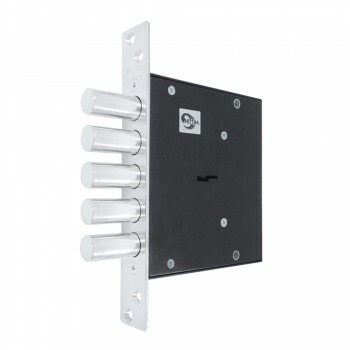 ), just how can we protect ourselves, if not for quality mechanical security products?